Susa (Latin: Segusio) was founded by the Gauls. In the late 1st century BC it became voluntarily part of the Roman Empire. Remains of the Roman city have been found in the excavations of the central square, the Piazza Savoia. Susa was the capital of the province of Alpes Cottiae. 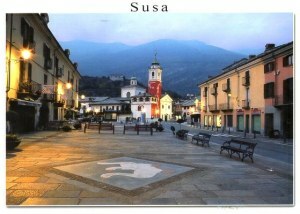 According to the medieval historian Rodulfus Glaber, Susa was "the oldest of Alpine towns".